3 ANSWER "Rally Against War and Racism"
Cheri Honkala is a Pennsylvania activist. The Pro Democracy Convention was held June 29th To July 1, 2001. It started with a National Town Hall Meeting, Annenberg Center, University of Pennsylvania. ANSWER "Rally Against War and Racism"
April 20, 2002 International A.N.S.W.E.R. Rally Activists representing various groups met on the Ellipse in Washington, DC to voice their support for a Palestinian state, criticize the Bush administration for its support of Prime Minister Sharon’s government in Israel, advocate a stop to racial profiling, and protest the treatment of Muslims at home and abroad. Speakers included Larry Adams - Labor Against the War, Pam Africa Activist International Concerned Family and Friends of Mumia Abu-Jamal, Sami al-Arian Professor University of South Florida (Tampa, FL)->Computer Science, Tariq Ali Author, Luis Alvarez Committee for the Rescue and Development of Vieques, Nihad Awad Co-Founder and Exec. Dir. Council on American-Islamic Relations, Brian Becker, Co-Director International Action Center, Vernon Bellecourt Director (Former) American Indian Movement, Mahdi Bray Director Muslim Public Affairs Council->Communications, Helen Caldicott M.D. Founder Physicians for Social Responsibility, Illel Cohen Activist, , Tarek Elgawhay Spokesperson Muslim Student Association Shaker Elsayed, Secretary-General Muslim American Society, Sara Flounders Spokesperson Iraq Sanctions Challenge, Jane Franklin Author, Teresa Gutierrez Co-Director International Action Center, Graylan Hagler Minister Plymouth Congregational Church of Christ (Washington, DC), Cheri Honkala, Founder and Executive Director Kensington Welfare Rights Union, Rafik Jaber President National Islamic Association for Palestine, Teresita Jacinto Member Committee for Indigenous Solidarity, Randa Jamal Member Palestine Right to Return Coalition, Amer Jubran Activist, Sala Kahn, Activist Magdy Mahmoud, President , Metropolitan Muslim Federation->New York, New Jersey, Carl Messner Co-Founder, Partnership for Civil Justice, Riya Ortiz, Representative Asha Samad-Matias Spokesperson Muslims Against Racism, Grace Trevettn Activist. Contact Sheet for the National Planning Committee of the U.S. Social Forum, Detroit 2010. Original April 09, 2009, Updated February 23, 2010. Poor People’s Economic Human Rights Campaign, PPEHRC (National) Cheri Honkala, Jennifer Cox. 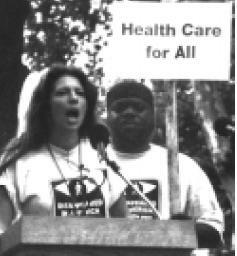 Cheri Honkala is the National Coordinator for the Poor People’s Economic Human Rights Campaign. She speaks worldwide about the struggle against poverty in the U.S., and the denial of basic economic human rights. She says, “And who better to change this than those that live within my country?" "We the poor of the world have the will to end poverty." Cheri Honkala, Director, Kensington Welfare Rights Union. Featured in the award-winning documentary, "Poverty Outlaw"
A leader of the March of the Americas, the World Summit of the Poor, and a 125-mile march of homeless and poor from the Liberty Bell in Philadelphia to the United Nations to protest welfare reform and poverty as a violation of economic human rights. The only welfare recipient allowed to testify to the U.S. Congress on welfare cuts. Served on the boards of many national organizations including the Urban-Rural Mission, the Reproductive Health Technologies Project, Pennsylvanians for Choice, the Alliance of Native Americans, and the Annie Smart Leadership Development Project. Refused to sign the Pennsylvania Agreement of Mutual responsibility (AMR on behalf of all welfare recipients on the grounds that without adequate guarantees of childcare, healthcare, and jobs at a living wage, the AMR is an unfair contract.) She was sanctioned from cash assistance. Single mom, formerly homeless, recipient of numerous awards for her leadership in the struggle to end poverty. Mother and son (the actor, Mark Webber,) lived on the streets homeless, using their experience to organize the poor. Playwright of "Taking it Back," a one-person play about her life pregnant and homeless. Cheri Honkala was a Vice Presidential candidate for the Green Party USA in 2014. With Robin Brownfield, Rich Fuller, Tom Violett, Cheri Honkala and Theresa Markila. Happy to be working a bit with Poor People's Economic Human Rights Campaign and New Jerusalem Now while I’m in the Philly area for a bit. — with Galen Tyler, Cheri Honkala and Meg Olkiewicz. In 2017 Our Revolution supported Cheri Honkala for Pennsylvania State Rep..
During the weekend of January 12th to the 15th, in Philadelphia, PA the Poor People's Economic Human Rights Campaign will be hosting a number of activities. This activities will culminate with a day of Teach-in and March commemorating the 50's anniversary march held with Dr. Martin Luther King and the Poor People's Economic Human Rights Campaign community. Community Film Screening of Flesh and Blood & Cheri's Fundraiser Birthday Bash! Panel following film with Darlene Elias, Cheri Honkala, Guillermo Santos, and Galen Tyler, moderated by Edgardo Gonzalez.